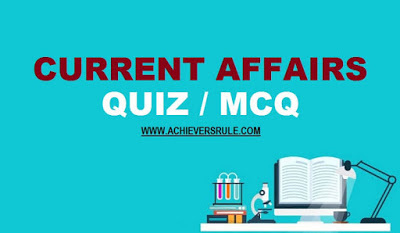 You must solve the Daily Current Affairs MCQ - 15th and 16th th December 2017 and get ready to face the upcoming IBPS, SSC exams easily. The Current Affairs Set consists of the questions of latest pattern, answers along with explanations that covers all the latest news updates i.e. sports, awards etc. Q1. Which of the following is the 163rd country to sign the landmine ban treaty ? Q2.An agreement is signed with Rajcomp to become its Business Correspondent with which Bank ? Q3.Jitesh Singh Deo has bagged the title of Peter England Mr. India 2017. He is from _____ ? Q4.Who is appointed as the next President of Indian Olympic Association ? Q5.Which bank has partnered with Pantomath Advisory for developing a MSME ecosystem in Maharashtra and Gujrat ? Q6.Name the Bank with which "FundsIndia" has partnered to launch UPI on their Andriod App for Mutual fund Payments ? Q7.Nokia has signed an agreement with which IIT for collaboration on Analytic and Artificial Intelligence ? Q8.Gurbir Grewal is nominated as the Attorney General of which state ? Q9.The World Telegu Conference 2017 would be held in which city ? Q10.Which Athlete has been named as the highest-paid athletes of all time according to the list made by Forbes ? Q11.______ has become the first country in the world to end national radio broadcasts on FM ? Q12.Sachin Siwach is associated with which sports ? Q13.AIIB has sanctioned a loan of 335 Million Dollar for the electric Metro Project in which city ? Q14.Hambantota Port is recently in news. It is located in _____ ? Q15.____ has announced to trade in Indian single-stock futures on its platform ? Explanation 1. Sri Lanka joined the international treaty banning antipersonnel landmines, Human Rights Watch said today. The action is especially significant because Sri Lanka used antipersonnel mines in the past and has since undertaken an extensive, ongoing mine clearance effort. Explanation 2. Fino Payments Bank has singed up Rajasthan government's Rajcomp as its corporate business correspondent to give banking services to people in the state. Under the agreement, all the 55,000 e-Mitra points of Rajcomp across the state will act as banking points of Fino Payments Bank. Explanation 3. Jitesh Singh Deo from Lucknow bagged the Mr. India World 2017 title. The finale of the gala sponsored by Peter England, was held at Bandra Fort here. It was judged by Bollywood's "Queen" Kangana Ranaut, designer Manish Malhotra and tennis player Mahesh Bhupathi among others. Explanation 4. Narinder Batra formally took over as the new president of the Indian Olympic Association after winning elections at the Annual General Meeting Batra received 143 of the 160 votes polled to elect the office-bearers for the next period of four years from 2018-22 while his rival Anil Khanna, honorary life president of the All India Tennis Federation, got 13. Explanation 5. YES BANK, India’s fifth largest private sector bank, has entered into a collaboration with Pantomath Advisory, an advisory services group and a leading merchant banker for MSMEs with a focus on Maharashtra and Gujarat, to develop the MSME ecosystem. This collaboration is part of YES BANK’s Alliances, Relationships & Technology (ART) approach, with an aim to enable better access to capital, knowledge and skills in order to help MSMEs scale up, thereby creating a multiplier growth effect for the overall Indian economy. Explanation 6. FundsIndia.com, a leading investment platform for mutual funds (MFs) and equities, has partnered with Yes Bank to launch Unified Payments Interface (UPI) on their Android app for MF payments. UPI offers the benefit of instant processing of payments and is currently the fastest way to complete mutual fund transactions, compared to net banking, NEFT and other payment methods. Explanation 7. Nokia joins hands with IIT-Delhi to work on analytics and Artificial Intelligence The collaboration will allow IIT-Delhi to leverage Nokia’s technological leadership and expertise in communications networking to conduct research in these areas. Explanation 8. Gurbir S Grewal, the first Sikh-American in US history, to be next attorney general of New Jersey The move has been welcomed by the South Asian Bar Association (SABA). Explanation 9. Hyderabad is all set to host the World Telugu Conference (WTC) being organised by the Telangana government with Vice President M Venkaiah Naidu inaugurating the five-day event. President Ram Nath Kovind would be the chief guest at the valedictory function of the WTC on December 19 at L B Stadium. Explanation 10. In the latest list released by Forbes, Michael Jordan has been named as the highest-paid athletes of all time. The 54-year-old has a whopping 1.7 billion dollar in the bank. Former world number one golfer Tiger Woods is standing at the second spot. Late America golfer Arnold Palmer is at No.3 with incredible 1.4 billion dollar to his name. Explanation 11. Norway has completed its transition to digital radio, becoming the first country in the world to shut down national broadcasts of its FM network. The country’s most northern regions and the Svalbard archipelago in the Arctic switched to digital audio broadcasting (DAB). Explanation 12. World youth champion Sachin Siwach was named the Asian Boxing Confederation’s best youth boxer of the year after winning an online poll conducted by the continental body. Siwach, who won the world title last year, claimed the Asian youth championships silver this year besides a gold at the Youth Commonwealth Games. Explanation 13. China-sponsored Asian Infrastructure Investment Bank has approved a USD 335 million loan for an electric metro project in Bangalore. The investment in the Bangalore Metro Rail Project-Reach 6 (R6) is AIIB's first metro project and its first joint financing partnership with the European Investment Bank, which is the project's lead financier with 500 million euros in funding. Explanation 14. Sri Lanka has formally handed control of a strategic Hambantota port on its southern coast to China as part of a 99-year lease agreement. Under a US$1.1 billion deal that the Sri Lankan political opposition and trade unions have called a "sell-out" move, Chinese firms now hold a 70 per cent stake in Hambantota port. Explanation 15. Singapore has announced to trade in Indian single-stock futures on its platform.